Bagworm on Red Cedar after a snow fall. The Evergreen Bagworm (Thyridopteryx ephemeraeformis) is not usually noticed in natural areas, but may cause aesthetic concerns in landscape settings, especially among non-native plantings and where there are few predators of them. Even then, most people never even notice the cleverly concealed caterpillar in its bag. Although they prefer evergreens such as cedars and arbor vitae, they have been found on over a hundred different tree species, including many deciduous trees, always using parts of the tree to cover their silken bags. If causing a concern in the home landscape where there are few natural controls, the bags can be snipped from branches before June and dropped into soapy water to control their numbers. The life cycle is most unusual, with the caterpillars feeding from their hidden homes through the summer, pupating for a couple of weeks, before then changing into adult moths. This usually happens during September or very early October, and only the charcoal-colored males with transparent wings ever leave the bags. The males seek out their mates for about 2 weeks before they die. The female sacrifices everything in order to be an egg production machine. She has no wings, non-functional legs, almost no eyes, and lacks even antennae and mouth parts. Her sole duty is to send out pheromones to attract a male and then lay eggs (200-1000 of them) inside her bag before dying. The eggs remain hidden in the bags, hanging throughout the winter. By the beginning of June, the newly born caterpillars will emerge from the bag, drop down on silken threads, and then either "balloon" with the wind to another plant, or drop down and climb up a plant to build their own bags and start the cycle all over again, often passing the mummified remains of their mother on their way out. On small isolated, mostly nonnative plantings, bagworm numbers can buildup and cause defoliation. 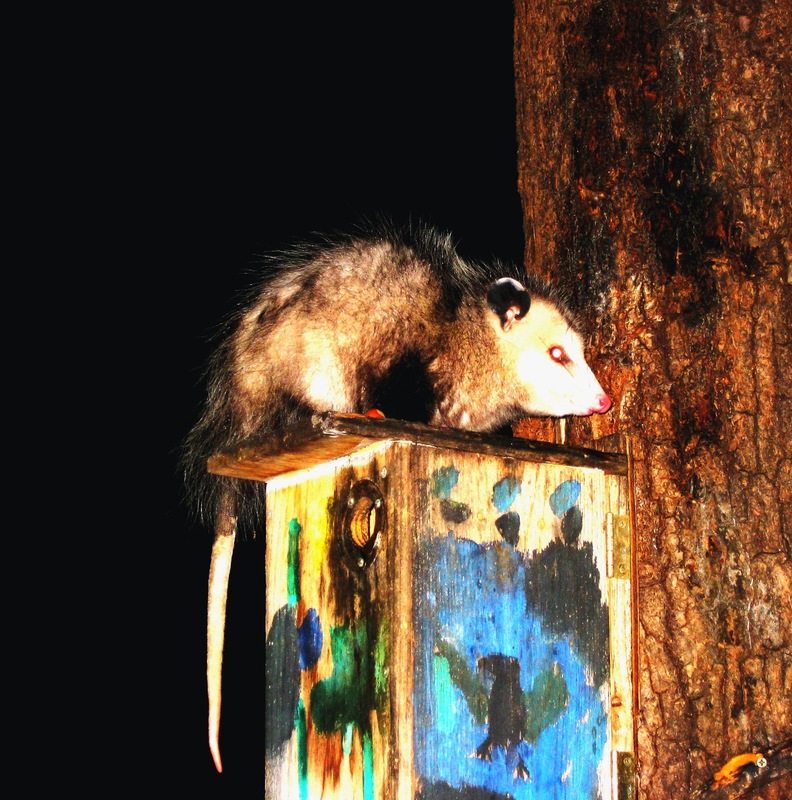 The Virginia Opossum (Didelphis virgininiana) is a fascinating native mammal with many unique characteristics. Even its names are uniquely Virginian, with the word "Opossum" being derived from a Virginia Algonquian Indian (Powhatan) word meaning "white animal" that Captain John Smith heard in 1608. Although sometimes just referred to as "Possums," that term technically is supposed to be applied to a certain group of marsupials in Australia. The Virginia Opossum is North America's only marsupial. The females (called "jills") give birth to as many as 25 young after only about 13 days gestation. These poorly developed young (called "joeys") then have to crawl their way into the jill's pouch ("marsupium") and find one of the 13 available teats (all of which do not always produce milk). The mortality rate is high. Even if they make it to cat-sized adulthood 2 months later, opossums have a very short life span for a mammal their size. Most only live for 1-2 years, and a 4 year old one is considered ancient. Both the jills and "jacks" (males) are unable to reproduce after their second year also. Those that have lived to an old age in captivity have been prone to obesity, but have been able to be litter box trained. Although a group of opossums is called a "passel," they are usually solitary wanderers. They have home territories, but tend not to sleep in the same location more than a few days at most. They have been slowly spreading North, but are ill equipped for the cold. In fact, they have poor insulating fur and are prone to frostbite, especially on their hairless ears and tails. Opossums have more teeth (50) than any other North American mammal. They also have an opposable big toe (hallux) on their hind feet unlike any other native animal. Their prehensile tails are also unique, but they are not strong enough to truly hang by them. It really acts more like an extra hand and to sometimes help carry things. Possum skull. Note the large number of teeth and cranial ridge you can use almost like a handle to pick up. But opossums are probably best known for the catatonic state they sometimes involuntarily fall into, "playing possum." This fainting spell can last for several hours, with the teeth bared, saliva drooling, eyes half closed, and a nasty odor being expelled. While in this state, they are semi-stiff and can be moved with out their being aware of it. This behavior is actually an unusual defense mechanism and rarely happens, especially in adult animals. I have only been witness to it once in my life, but was that memorable. The one I found first tried to get away, but then turned and showed its numerous teeth, hissing. I was very surprised when it just then tipped over and "died." The Virginia Opossum is not appreciated very often, many people just considering it a big, dumb "rat." But they have some incredible adaptations and are very special in so many ways. This has allowed them not only to survive for 70 million years, but to actually thrive and expand their range, often times into our yards and cities. This is something to keep in mind next time you find one of these nocturnal animals, the awesome opossum. ﻿ Naturalists often have "cheats" that they use to help them remember natural history facts. The saying "MAD CAP Horse" is such a saying, used to help in identification of native trees in the Mid-Atlantic. 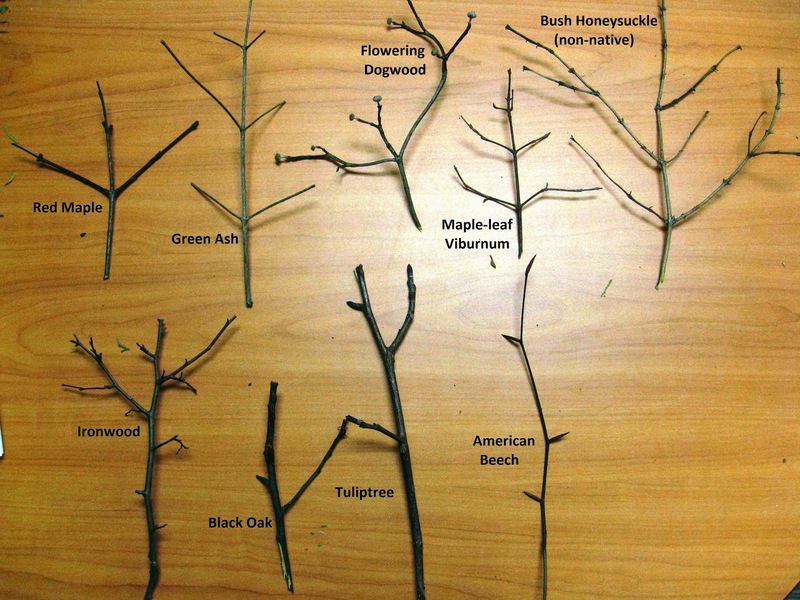 One of the basic steps in identifying trees is often figuring out whether they have alternate (staggered) or opposite (one twig directly opposite the other) branching throughout most of the tree. If the branching is opposite, then it eliminates many other possibilities, as there are far fewer woody plants with opposing branching systems. So what does the mnemonic "MAD CAP Horse" stand for? Well, MAD corresponds with the Maples, Ashes, and Dogwoods, which almost all have opposite branches and twigs. There are a few exceptions, such as Alternate-leaved Dogwood, but it works for most native (and many non-native) woody plants throughout the Mid-Atlantic and many other locations. "CAP" stands for the old family Caprifoliaceae, which was the family of mostly short shrubs like Honeysuckles, Viburnums, and Elderberries. Some have now reclassified them into other groups, but this work with the previous classification system that most people still know and recognize. "Horse" stands for the Horsechestnut genus, which includes the buckeyes. Now the mnemonic isn't perfect, with things like Euonymus not fitting in and a couple of other exceptions, but it is still pretty reliable and can help a lot in classifying and identifying native trees. And if you have to include Euonymus, I've even heard the saying "Uwanna MAD CAP Horse" and other versions. But for me, the classic naturalist saying has always stood me well when I was trying to identify trees and shrubs. The first flower to bloom every year can be found in our bogs and wet areas, sometimes blooming right through the snow as early as January. Skunk Cabbage, Symplocarpus foetidus, goes by a variety of names, many dealing with its peculiar odor or large leaves in summer: Stinking Cabbage, Skunkweed, Meadow Cabbage, Swamp Cabbage, Fetid Hellebore, Midas Ears, Clumpfoot Cabbage, Collard, Polecat Weed, and Parson-in-the-pillory. Its unusual-looking flowers attract pollinators in two ways. First, the smell attracts carrion-loving insects like flies. Secondly, the heat it generates (strong enough to melt through snow and keep the flowers around 70 degrees F for a couple of weeks) is sought after by many insects because they are ectothermic (cold-blooded) and thus need the warmth. Colonies of these wetland obligate plants can last for centuries and individual plants are thought to be able to survive for up to 200 years. The smell is thought to make the plants unappetizing to most animals (slugs and bears being an exception). But if that was not enough, the leaves are protected by calcium oxalate crystals, causing a chemical burn to anything consuming them. The chemical properties are eliminated by drying however, something many tribes learned so that they could make flour and otherwise eat them. There were many medicinal uses for them too. The Abnaki for example used the large leaves to treat swelling and rheumatism. The Chippewa and Delaware used an infusion of the roots to treat coughs. The Micmacs believed the strong smell could relieve headaches. Many other tribes used them as a poultice for wounds and cuts. One of the more interesting uses was by the Menominee who used the powder mixed with dyes and inserted it into the flesh with animal teeth as a means of tattooing themselves. For me, they are a reminder that winter will not last forever, and this unusual flower will triumph even through snow. They may provide early waking insects with one of the very few pollen sources out there, but they also serve as notice that other spring flowers will soon be on their way as well. Whether you call it a Groundhog, Woodchuck, Grease Pig, Whistle Pig, Whistler, Marmot, or Monax, most people have heard about Marmota monax, the only rodent with its own holiday. Here are a few things you may not know about it though. Groundhogs are actually also our largest ground squirrels. The bone projection above its eye socket (postorbital process) help place it in the squirrel family, Sciuridae. They are not only champion diggers (their name Monax comes from Carolina Algonquian Indian for "digger"), but can be good climbers like other squirrels, despite their large sizes and fat. They may not do it often, but they will climb, especially in search of fruit. I've twice surprised them (and myself) when I came upon them in trees. Groundhogs are also the only rodents found locally that I am aware of that have white incisors. All other rodents that I know of around here have hardened enamel that is often yellow, orange, or otherwise discolored. Finding any rodent skull with white incisors is usually a good clue that you found a woodchuck. Whistlers (so-called due to their whistle-like calls) are also one of the few local mammals that are true hibernators. Most other so-called hibernators wake up periodically and do not undergo the metabolic processes of real hibernation. So this Groundhog's Day, all self respecting woodchucks are in deep slumber. So have a Happy Groundhog Day, but don't expect to see any real wild woodchucks for some 6 more weeks or so.